I have a thing for ice. It starts with cocktails, and other cold drinks: the image of crystal clear cubes of ice, clinking in a frosted lowball glass, really appeals to me. There are a couple problems with the kind of ice you can easily make at home. First off, the shape is all wrong. A typical refrigerator-door icemaker produces crescent-shaped ice, or sometimes hollow cylindrical pieces of ice. 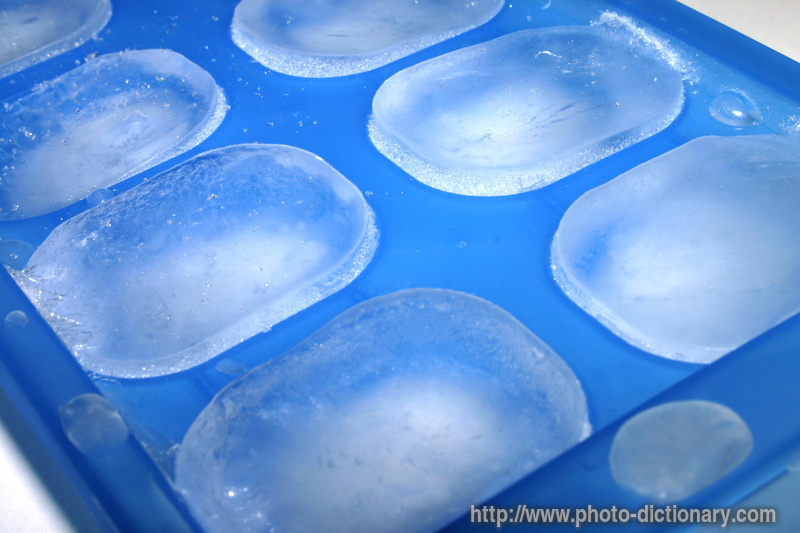 Ice cube trays generally make oblong, slanted pieces of ice. These are not ice cubes at all! There's an easy solution for this, which is to buy molds that are actual cubes. The Tovolo Perfect Cube Ice Tray is one such option; you can find it for about $14 at Amazon.com. The ultimate cool shape, though, is a huge ice ball. I secretly (well, maybe not too secretly) lust after this nearly $2,000 ice ball mold. The next problem is cloudiness in ice. When ice comes out of your freezer at home, it is almost certainly nearly opaque, with a white cloudy center, generally caused by trapped air bubbles. Aside from the obvious problem of ice melting, this is one of the reasons that food photographers use acrylic fake ice cubes in photographs of drinks. If you search on-line for "crystal clear ice cubes," you will find a lot of incorrect information. Most pages (for example, this Instructable, this eHow recipe, or this Yahoo! Answer) give the following (incorrect) set of steps. Start with filtered or distilled water (a few recipes start with sparkling water, which seems totally off base). The idea here is that impurities cause the cloudiness. Boil the water (sometimes, boil it twice). The idea is that hot water contains fewer dissolved gasses than cold water, so you boil the water to make it flat. Freeze in an ice tray as normal. I have tried the above recipe, and many variations of it, at home, and I am afraid it just doesn't work. I found that following either or both of these steps results in ice cubes that seem slightly less cloudy than just regular tap water, but certainly not crystal clear. You don't have to take my word for it that the "boil filtered water" recipe is bunk. See the fantastic photodocumentary, The Ice Experiment by Don Feduardo, which matches my results at home. Camper English (who shares my ice obsession, and has an excellent set of articles on clear ice on Alcademics) also independently verified that boiling water doesn't make clear ice. You can read more from this Alaskan scientist's perspective on clear ice. I also found a great in-depth discussion on ice cubes and air bubbles from Khymos, a molecular gastronomy blog.